Harissa is a mountain village in Lebanon. The village, which is located 650 meters above sea level, is home to an important Lebanese pilgrimage site, Our Lady of Lebanon. The village is located 20 km north of Beirut, and accessible from the coastal city of Jounieh either by road or by a nine-minute journey by a gondola lift, known as the "Téléférique". It attracts both pilgrims and tourists who want to enjoy views of the bay of Jounieh. 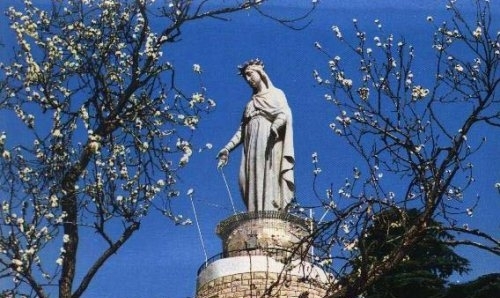 The pilgrimage site is a huge 15-ton bronze (and painted white) statue of Virgin Mary, known as Our Lady of Lebanon, with her arms outstretched. The statue was made at the end of the 19th century and inaugurated in 1908. Inside the statue's base there is a small chapel. A huge modernistic Maronite cathedral built of concrete and glass stands right beside the statue.